To add a ° suffix to your labels in Surfer, hold the ALT key down and type 248 on the numeric keypad on the right side of the keyboard (not the numbers along the top). Then release the ALT key and the ° is entered. In the Properties window click the Labels page. In the Label Set 1 section, expand the Label Format section. Click in the edit box to the right of Suffix and hold the ALT key down while typing 248 on the numeric keypad. Release the ALT key and the ° is created. Press ENTER on the keyboard and the ° suffix is added to your post map labels. On the Labels page in the Properties window, expand the Label Format section. 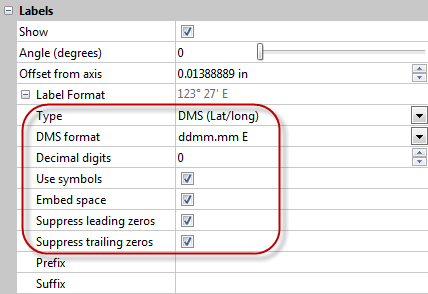 Change the Type to DMS (Lat/long). Ensure the box next to Use symbols is checked.